↑ Buchanan, James. 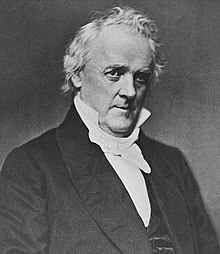 "Inaugural Addresses of the Presidents of the United States: James Buchanan; Inaugural Address, Wednesday, March 4, 1857". Bartleby.com. Bartleby.com, Inc. Retrieved October 8, 2016. Having determined not to become a candidate for reelection, I shall have no motive to influence my conduct in administering the Government except the desire ably and faithfully to serve my country and to live in grateful memory of my countrymen.